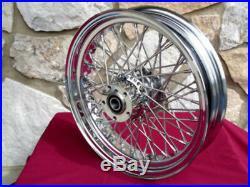 18X3.5 KCINT 60 SPOKE FRONT WHEEL 00-07 HARLEY STREET ROAD GLIDE KING ULTRA. Brake Calipers & Brake Pads. Brake Drums & Sprockets. Brake Rotors & Pulleys. Chain Belt Guards Chain/belts. Clutch Primary Drive Line. Batteries Boxes Covers Related. Headlight & Spotlight Related. Turn Signals & Tail Lights. Carburetor & Air Cleaner. Engine Parts & Covers. Oil Filters & Lubricants. Oil Tanks & Brackets. Exhaust Vance & Hines. Exhaust / Mufflers Related. Forward Foot Controls Related. Dash Speedo Instrument Related. Gas Tanks & Caps Related. Hardware Kits Axles Spacers. Luggage Tour & Saddlebags. Swingarms & Wide Drive Kits. Front & Rear Suspension. Front Ends DNA Wide Glide 41mm. Front End Fork Tubes 39 & 41mm. Front End Sliders & Lower Legs. Front End Vintage Springer. Front End DNA Springers. Triple Trees / Fork Related. Handle Bars & Controls. Hand Controls Levers Related. Mirrors Chrome & Black. Motorcycle Shop Misc Tools. Wheel Bearings Axles & Spacers. Wheels 40 Spoke Billet Hub. Wheels 60 Spoke Billet Hub. Wheels 80 Spoke Billet Hub. Wheels 80 Spoke Kc Int. Wheels Custom Mag Wheel Sets. Wheels Dna Extreme Motocross. Wheels DNA Fatty 40 Fat Spoke. Wheels Ultima 48 Fat spoke. Wheels Dna Mammoth 52 Fat Spoke. 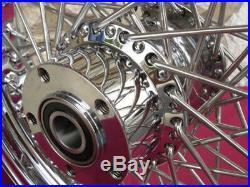 This dual flange front wheel fits 2000-07 Touring applications, Road King FLHR, FLH, Ultra, Dressers. Wheel is built by Americans. High end first quality wheel. Triple show chrome billet hub. 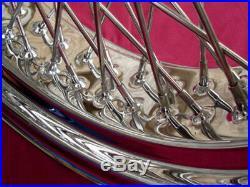 Triple show chrome rim. 1 Sealed bearings and inner spacer included. Harley-Davidson® Model Fitment Chart. Below are photos of many other items related to the item listed above. THANK YOU FROM KCINTERNATIONAL – KCINT! WARNING Limitation of Liability: KC International Motorcycle Supply (KCInt) shall not be held liable for any damages that result from the Improper installation of parts, use, control, alteration or maintenance of motorcycles. Improper installation can cause serious injury, death and/or property damage. We recommend that all parts are installed by a licensed motorcycle dealer which is certified to work on Harley Davidson® motorcycles. This dealer must use good judgment in helping customers in the selection of parts for installation. KC International Motorcycle Supply (KCInt) has no control over the judgment of others and assumes no responsibility or liability of any nature for the failure of others to use good judgment. This also includes wrongful or negligent on behalf of you or any person acting on your behalf. Image Permission: Images used in our ads are the property of KC International Motorcycle Supply (KCInt) and have embedded watermarks not visable to the eye. KC International Motorcycle Supply (KCInt) has the right to change, edit or terminate the terms and conditions at any time without prior notice. All sales from KC International Motorcycle Supply (KCInt) constitutes an understanding and agreement to all policies, terms, and conditions set forth by KC International Motorcycle Supply. If there is a issue with your order we will try to contact you as soon as possible. Payments must be made in U. In some parts of the country it is illegal to receieve or use some of our products. It is up to the customer to determine the items that are illegal in your area. KC International Motorcycle Supply, Inc. The following terms are affiliated with KC International Motorcycle Supply: KCINTERNATIONAL, KCINT, KCInternational. Founded in 1978, KCInt built its reputation by providing high-quality after market motorcycle parts to its customers with courteous service. We provide quality products at competitive prices to our customers. We have many hard to find parts for those early motorcycles and the newest creations for your latest custom motorcycle project. Order any time, you never have to wait to place a large order. To save time, please have your card information ready when ordering. RETURN INFORMATION Any item. Item must be unused and in sale-able condition. KC International Motorcycle Supply (KCInt) is not responsible for any charges for labor, repairs, materials, down-time or lost profits due to returning any merchandise. RETURN AUTHORIZATION Before returning any item, please notify us so that we can provide you with a. And we will give you specific instructions on how to proceed with your return. To speed authorization, please provide us with the invoice number, order number, and order date when you call. Dayton, OH 45420 Tel. The item “18X3.5 KCINT 60 SPOKE FRONT WHEEL 00-07 HARLEY STREET ROAD GLIDE KING ULTRA” is in sale since Friday, June 28, 2013. 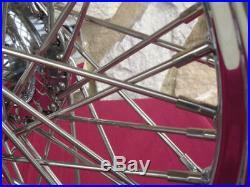 This item is in the category “eBay Motors\Parts & Accessories\Motorcycle Parts\Wheels, Tires & Tubes\Other Tire & Wheel Parts”. The seller is “kcint” and is located in Dayton, Ohio. This item can be shipped to North, South, or Latin America, all countries in Europe, Australia, Japan, China, South Korea, Taiwan, South africa, Thailand, Hong Kong, New Zealand, Philippines, Singapore, Saudi arabia, United arab emirates, Qatar, Kuwait, Malaysia, Viet nam, Brunei darussalam, Egypt, Jordan, Cambodia, Sri lanka, Maldives, Oman, Reunion.